For Christmas, Jake's parents got us (him) a smoker. Our friend Ed has one and smoked turkey and sausage for a party we went to and Jake was inspired. Jake's dad has a huge smoker and has always made awesome bbq so he thought it was time he got in on the game. The first opportunity he had to smoke something was the Tuesday of Beth and Eric's visit. We got a frozen whole turkey on sale for 39 cents a pound at Kroger - that put our total at about $3 for the turkey. We bought some Cajun Butter inject able marinade (Cajun Injector brand) for about $4. Jake had to stay home and write a paper for school anyway, so he spent the day smoking away. 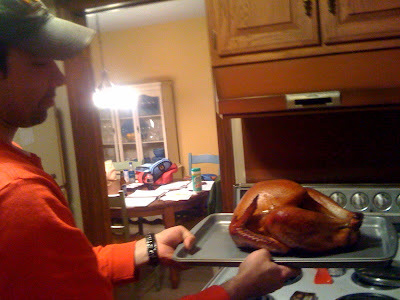 While we were out shopping, the turkey was cooking. By the time we got back from the zoo, it was almost done! We mis-timed just a little bit and had to stick it in the oven for about 10 minutes to finish it off. This didn't affect the flavor one bit though. I typically do not like turkey very much but this smoked turkey was moist, tender, and had a great flavor. It fed 4 people generously with enough left over for lunch. I'd say it was a good $7 spent for dinner! Jake's next adventure with his smoker was on New Year's Eve when he smoked a pork shoulder and some sausage for our NYE party. Jake has already begun perfecting the art of smoking and really enjoys it. I would definitely recommend getting one! 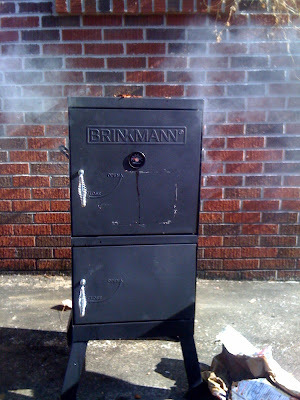 when my dad got a smoker he smoked everything he could put in there. i mean everything. it is really good though and they do make amazing turkey!